When it comes to setting the mood or creating a more intimate living environment, nothing will get you closer to accomplishing your goal than proper lighting. With the right lighting, you can transform a dreary den, living room, or kitchen into an inviting hub where all your family and friends will want to gather for entertainment and fellowship. One of the best ways to give a room a character all its own is through chandeliers. Don’t give into the myth that you have to spend loads of money in order to buy fancy chandeliers to light up your home. 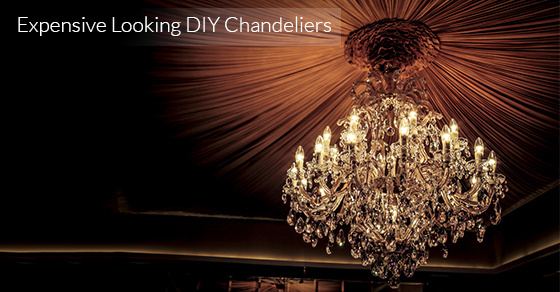 What follows are a couple of expensive looking wood chandeliers that you can DIY. Using a nice branch, you can create the sort of unique, trendy chandelier that would look great over your dining room or kitchen table. The star of this DIY project is, of course, the branch. Find a tree limb that has lots of branches. If the leaves are still on it, remove them. You’re then going to need some light bulbs, light bulb sockets, and the wiring required to safely attach each light to a branch on the tree limb and then to attach each wire to the power source. Once you’ve acquired what you need and have done the prep work, you need to connect the light bulb-laden chandelier to the power source and ensure that the chandelier is properly attached to the ceiling. If you have basic electrical skills, you’ll easily be able to do this on your own — remember to disengage the fuse panel box to prevent electrocution. Have an electrician do this last part of the DIY project if electrical work isn’t your thing. Another DIY idea for a wood-based chandelier involves using another part of the tree — the trunk. You’ll want a piece of the trunk — maybe an inch or two in thickness. When you hold it horizontally in your hand, the piece of the truck should resemble a cut of steak, a plate, or anything else that’s relatively flat and roundish in shape. Either use a chainsaw to get the wood or pay someone to do it for you. For this sort of project, it would be even better to get your trunk piece from a tree that is less than symmetrical since it will look more interesting than a perfect-circle trunk piece. Once you get the piece you want, drill some holes in it so that you can get the wires from the bulb sockets to the power source. After you’ve completed this step, you’ll need to attach the wires to the power source and the chandelier to the ceiling. Either do the electrical work yourself or get someone else to do it. As you can see, there are different ways to spruce up your home and to bring in some light. The aforementioned ideas are relatively simple and will definitely light up your residence.